The ErgoSlide® LT can be used to move a patient from bed to bed, gurney/stretcher to bed, or exam table to bed without pulling the patient’s body, arms or legs, and without the caregiver having to lift. Even more, when using the LT, there is not a need for multiple caregivers to execute the move. That’s right, now one caregiver can easily perform a lateral transfer without using mechanical lifts, assuming the caregiver has assessed that he or she will be able perform the move. 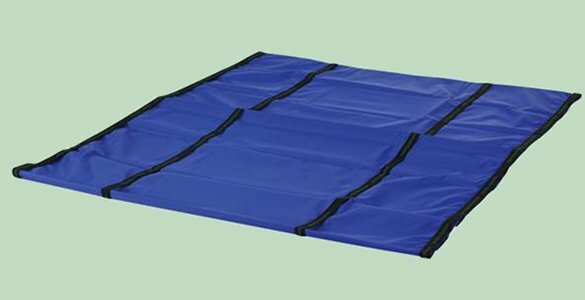 Constructed from a strong nylon material sewn into a long roller band, the ErgoSlide® LT has four rows of webbed handles around the full length, which are used to perform the lateral transfer. ErgoSafe recommends that caregivers practice with the ErgoSlide® LT prior to actual patient care, as working with each other will allow you to appreciate the feeling from the patient's perspective. It is imperative to provide proper patient care and to limit risk of injury to caregivers through the use of ergonomic manual handling aids such as the Slide Sheet. Learning to turn, sliding patients up and down in bed, or simply repositioning the patient can be accomplished safely and easily by implementing the standard use of an ErgoSlide® in your healthcare facility today. ErgoSafe Products works closely with nursing homes and other care giving institutions to provide patient handling devices to assist caregivers with their daily tasks of moving and repositioning patients. Call ErgoSafe today and begin employing safer conditions for your employees and patients.